South Jakarta Fire and Rescue Sub-dept. is holding fire handling socialization in RW 06, Jati Padang, Pasar Minggu.
" 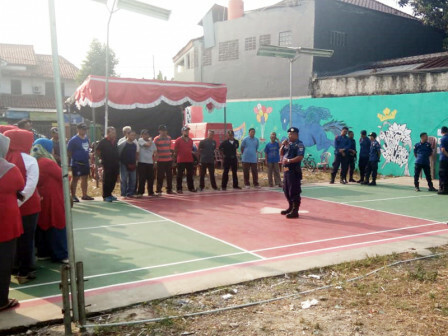 By so residents can find out what is done if they know of a fire before the officer arrives"
Yusuf Yodha Brata Kusuma, Team Head of Pasar Minggu Sub-district Sector IX said that socialization is conducted to provide knowledge to residents regarding fire prevention that can be done by residents. "By so residents can find out what is done if they know of a fire before the officer arrives," he expressed, Monday (8/13). He explained that it is participated by chairmen of RT 01 and 15, chairman of RW 06, LMK, PKK cadres, Jumantek cadres, as well as karang taruna members. Every participant is taught how to use the flames through traditional tools and portable extinguisher (APAR). "Traditional tools are easy to get by residents such as towels or wet sacks. So it is faster to deal with fires, especially those caused by gas compost," he stated.